In its search for extrasolar planets, the Kepler space telescope looks for stars whose light flux periodically dims, signaling the passing of an orbiting planet in front of the star. But the timing and duration of diminished light flux episodes Kepler detected coming from KIC 846852, known as Tabby’s star, are a mystery. These dimming events vary in magnitude and don’t occur at regular intervals, making an orbiting planet an unlikely explanation. The source of these unusual dimming events is the subject of intense speculation. Suggestions from astronomers, astrophysicists, and amateur stargazers have ranged from asteroid belts to alien activity. 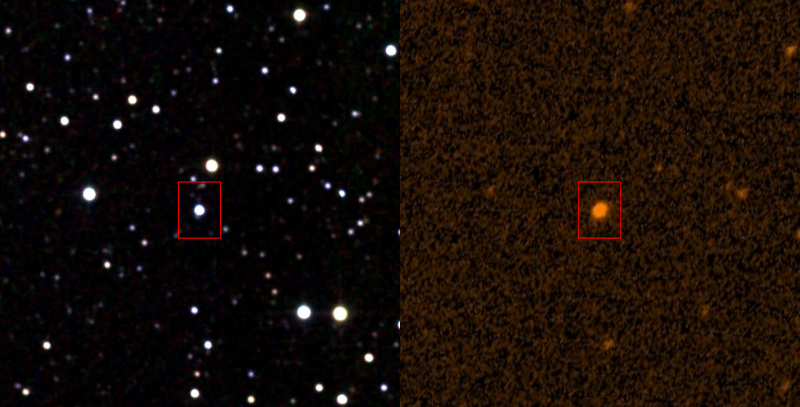 Now a team of scientists at the University of Illinois at Urbana-Champaign—physics graduate student Mohammed Sheikh, working with Professors Karin Dahmen and Richard Weaver—proffer an entirely novel solution to the Tabby’s star puzzle. They suggest the luminosity variations may be intrinsic to the star itself. Tabby’s star is in most regards a standard F-class star, located in the constellation Cygnus, approximately 1,276 light years from Earth. Its unusual light curve—the graph of its light intensity as a function of time—shows intense dimming events of up to 20 percent, punctuated with smaller irregular dimming events. The Ilinois team applied a statistical analysis to the light curve’s smaller irregular variations. What they found is a mathematical pattern consistent with a well-established avalanche model: the smaller dimming events are the “crackling noise” or small avalanches that are observed during the time intervals between the larger avalanches, equated to the larger dimming events. The small dimming events come in a remarkably broad range of sizes, which are distributed according to a simple scaling law. These results suggest the dimming events may be intrinsic to Tabby’s star and that the star may be near the critical point of an underlying continuous phase transition. Sheikh performed the calculations for the analysis of the observational data. He explains the mathematical method, which starts by establishing a median dimming threshold across the light curve. Avalanches have two main properties, size and duration. The size is the total area enclosed by the light curve (underneath the threshold) and the threshold. The avalanche size,” continues Sheikh, “is related to the net decrease in energy emitted by the star during the dimming event, when compared to a constant emission rate of the star, or the constant threshold value. The avalanche duration is the length of the event. We also look at the power spectral density, which is related to how much power per unit of frequency is contained in the light curve. Power laws have the interesting feature that they look the same on different scales. So when you zoom in to small scales and short times you get the same types of statistical distributions as when you zoom out to larger scales and longer times. Power laws reflect self-similarity of the system over a wide range of length and time scales—similar to fractals—that look the same when you zoom in or when you zoom out. Significantly, the statistics of Tabby star’s smaller dimming events are consistent with the predictions of a scaling theory. In her body of research, Dahmen has established that a small-event scaling pattern punctuated by larger events is typical of systems near a phase transition. She has seen this in the intermittent deformation dynamics of nanocrystals, the event statistics of metallic glasses, rocks, and granular materials, and in earthquakes on much larger scales spanning 12 decades in length. Similar types of avalanches are also seen in neuron firing avalanches in the brain, in magnetic systems, and in many other condensed matter systems. Dahmen adds, “Our work gives a framework on how to analyze the data and perhaps even to classify stars into how close or how far away the stars are from such a transition. These statistical analysis tools have been tested and successfully applied to avalanche noise in magnetic systems and plastic deformation. We are transporting these tools to astrophysics to learn more about the dynamics of stars and eventually to compare different stars.